Many of the Catholic parishes in the Highlands of Scotland were also ‘crofts’ – which allowed the priest to support himself and the parish by living off the land. A croft is a small free-hold of land which allows sustainable living. As communities have got wealthier, the need for the parish to sustain a croft has diminished. However I now in many places the vestiges continue. I have had the joy the last few years to go to the Outer Hebridean island of South Uist for a few weeks supply in the summer at this parish click here. The priest still has his own flock of sheep, real not metaphorical, and last summer I was presented with my own lamb, butchered and prepared by the parish shepherd! Here in Arisaig the priest keeps over 40 chickens, and ably assisted by the wonderful Winnie (left) we have a regular supply of ‘holy eggs’ which parishoners pick up and are enjoyed at breakfast. I have really enjoyed feeding the chickens with Winnie and learning about poultry-care. Even better of course is enjoying the fruits of their labour. The parish house is equipped with a magnificent double egg-cup – first time I have seen one! Not only does it allow you to be greedy – but also to compare tastes. 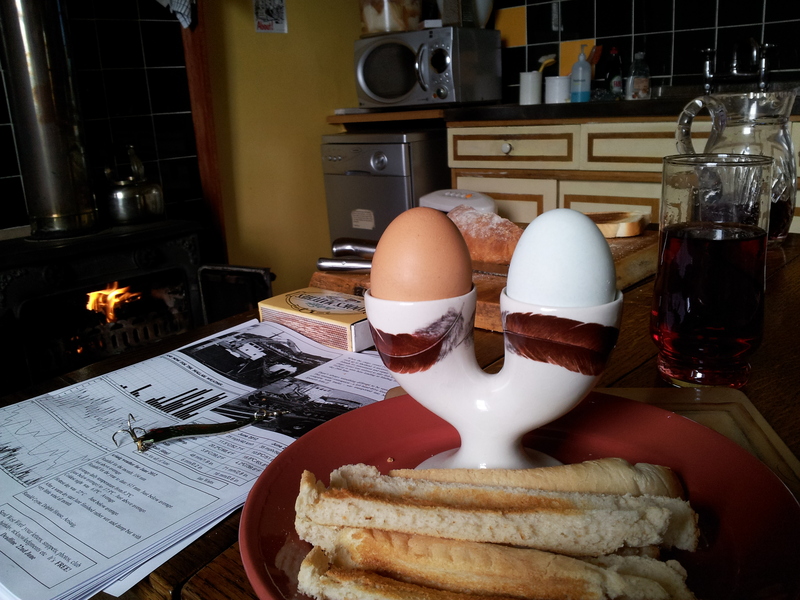 Today I tried the light blue shelled egg along side a Polish chickens classic brown colour egg. The Pole edged it slightly – with one of the richest yolks I have every enjoyed. It is true that free-range tastes much nicer. There is a serious point – the growing movement of eating locally sourced and in-season products. Not only does it support the local economy, the food is healthier and tastier! Scotland seems to be leading the way with this and the influential Fife Diet. Asking local people to sign-up to eating food from the region of Fife, for a year, and to monitor their progress and share their experience. 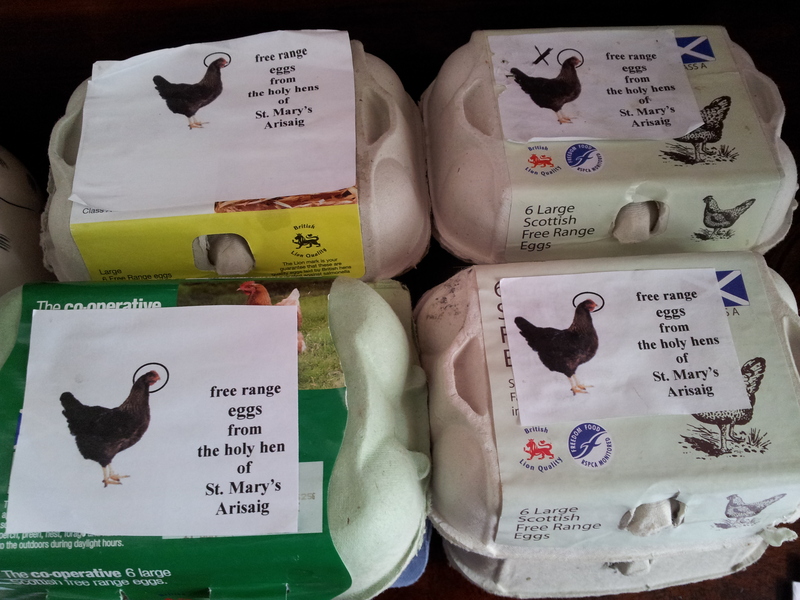 The project has developed from a voluntary network into a funded body and in its development has changed from a small amount of people dedicated to eating ‘from Fife’ for a year, to a much larger network of people trying to re-localise more generally and to explore what sustainable food might be. It has won awards for ethical consumption. 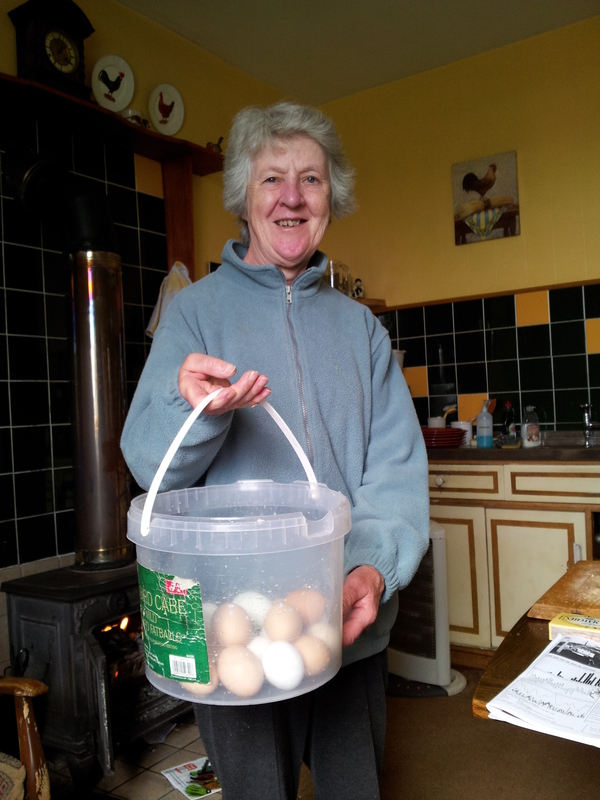 Seeing the parishioners donate money and pick up their eggs on Sunday was very inspiring – particularly as the younger contribute a bit more so the older folk can get their eggs very cheaply. This could be a great idea for other parishes to take up! Last weekend I went back to stay with the family who had kindly hosted me in October in Navotas. We had a great time singing karaoke till 3am – lots of Beatles of course! Navotas is a ‘squatter area’ i.e. what might be referred to as a slum area in Manila – overcrowded and under-served with utilities. Over the years it has become better established with electricity and running water in some areas, but there are still many areas where there is none. 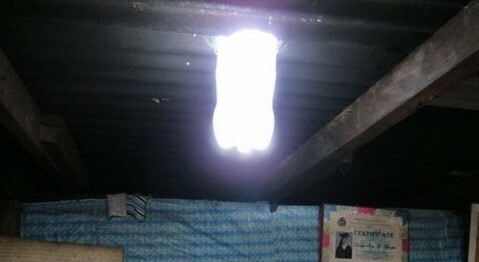 That is why I was very excited to find out about this Philippino initiative – called ‘a litre of light‘. Fantastic! Just by getting an empty plastic bottle and filling it with water and household chemicals – and placing half of it so that it catches the sun. This ‘solar bottle’ could make a big difference to the life of many people around the world. It is also recycling waste products. I can’t wait to see it being installed in Navotas. The video below shows you how it works. You can also find more about it by clicking on their website – click here. This wonderful project reminds me of another story i have just posted on my other storytelling blog – click here. A wealthy Chinese businessman was now old and wanted to retire. He called his three sons too him and said to them, ‘ I have decided not to divide the business into three, but will give it to the one of you who proves himself to be the best businessman. You can prove this to me by passing a simple test.’ Each son was given $10 and instructed to use the money to purchase something that would fill a big empty room. The first son went and bought a big tree, after cutting it down, he dragged it to the room, it filled up about half the room with its leaves and branches. The second son went and bought the kunai grass that some of the farmers were cutting in their fields, this filled up most of the room. The third son went and bought a small candle for 25 cents, and in the evening after dark, he called his father over to the large empty room. He put the small candle down in the middle of the floor and lit it. After a minute he turned to his father and said, ‘Dad can you see any corner of this little room which is not filled by the light of the candle?’. He won the business. You may remember the terrible tragedy before Christmas in the South of the Phillipines – due to the Tropical Storm Washi (or Sendong as it is known in the Phillipines). The Death Toll has reached nearly 1500 now. However the news has moved on – even here in the Phillipines there has been a landslide which has killed 30 and that is dominating the news now. Why did so many people have to die? The excellent ESSC (Environmental Science for Social Change) a Jesuit research institute has already produced a report – as well as the Manila Observatory and the Ateneo Physics Departments. But as always it seems to be falling on deaf ears – political short termism and corruption seem to prevent progress. So what is the answer? I have been very impressed by the response of the Phillipino Jesuits. In the affected areas of Cagayan de Oro – the local Bishop, High School and Universities are all in the care of the Jesuits. 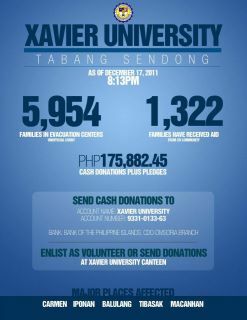 The Xavier University in Cagayan de Oro has been at the forefront of the relief effort. They have even offered 5 hectares of land to help relocate victims (click here) . One of Fr Pedro Walpole‘s strategies with the ESSC is to help build up disaster resilience, and move beyond relief – to building up a strategic capacity to respond. With the President of the University Fr Bobby Yap they have suggested four ways forward – this is taken from their commentary. “Emergency preparedness. A warning system on every typhoon in every area of potential risk must be put in place, and not just announced. A day or night evacuation strategy must carefully lay out the locations, paths and methods to reach safe areas for evacuation and temporary settlement. Relocation and land allocation. A critical review and implementation of land allocation and securing access are vitally needed to assist city and local governments in identifying safe lands for settlements and the procedures for acquisition. A prioritized relocation plan for every city and barangay that sets accomplishments is imperative. This plan should not be simply mitigation activities, like developing and rebuilding infrastructure that will not withstand the next disaster. A sustainable relocation must consider people’s livelihood accessibility so that livelihood is sustained and risks are minimized. Landscape and waterscape planning and development. An open, transparent planning process for infrastructure development is crucial with broad participation of key people, especially in critical areas of river banks, slopes and floodplains. Floodplain management. To re-establish natural flood areas, we need to develop a floodplain management program and regulations that strictly enforce restrictions and controls in: the alteration of natural floodplains, stream channels, and natural protective barriers that channel floodwaters; developments that increase flood damage; and construction of flood barriers that unnaturally divert floodwaters and increase flood hazards in other areas. But are the politicians listening? A column written by another Jesuit, Fr Tony La Vina in a popular Manila paper click here ceratinly puts pressure on the highest political levels. Click here to read it and a powerful personal account of survivors.